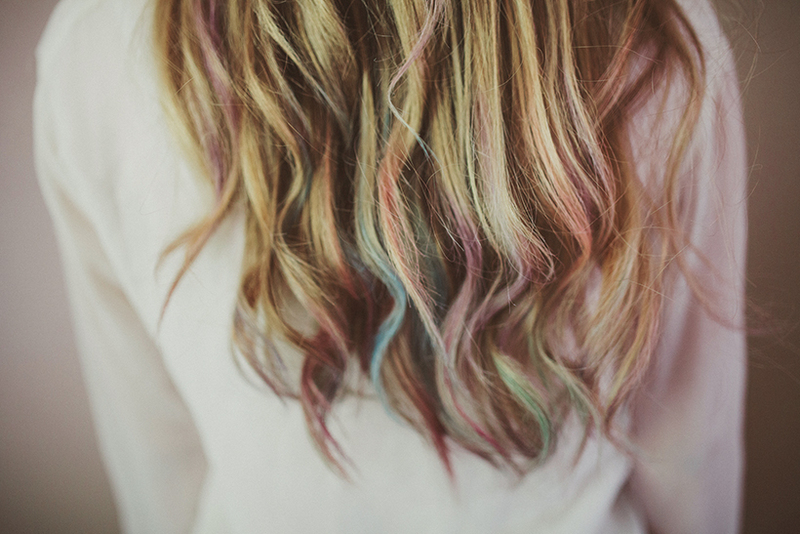 I'm all about hair chalk for the summertime. It's a fun, less committed way to add a bit of pop to your strands for the warmer months. I asked my sweet intern, Erica, to be my guinea pig for this project. 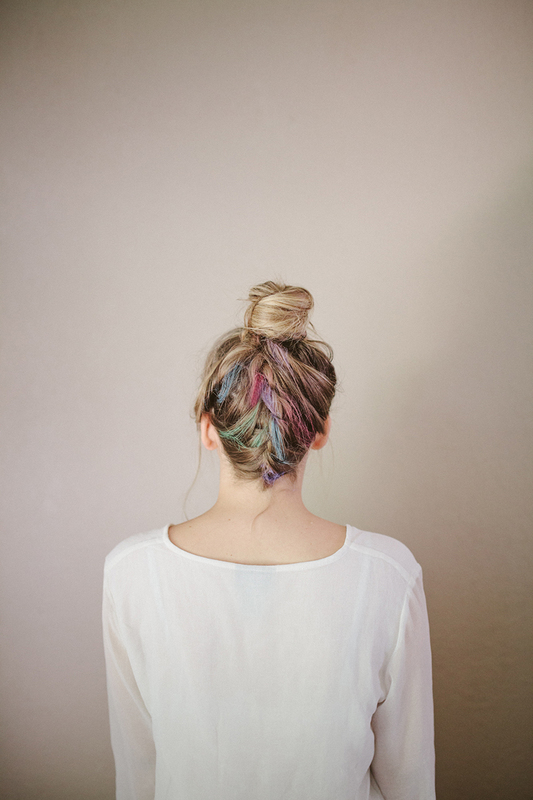 When adding chalk to your hair, there are a few things you should know. Be sure you get chalk pastels, NOT oil pastels. To enrich the color and help it stay through a wash or two, slightly dampen small sections before you apply the chalk. To apply, tightly twist small strands of hair and color it with the chalk from top to bottom. Twist the ends in small sections and add color 3-7 inches high. 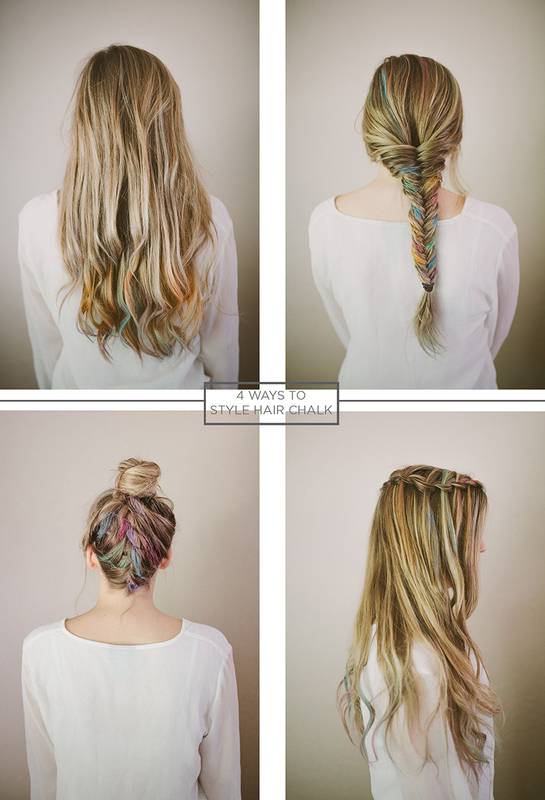 Try adding multiple colors to one strand, giving it an even more multicolored effect. Apply the same effect as tipped ends, but chalk the strands all the way to the root of your hair. Then, begin braiding a fishtail. 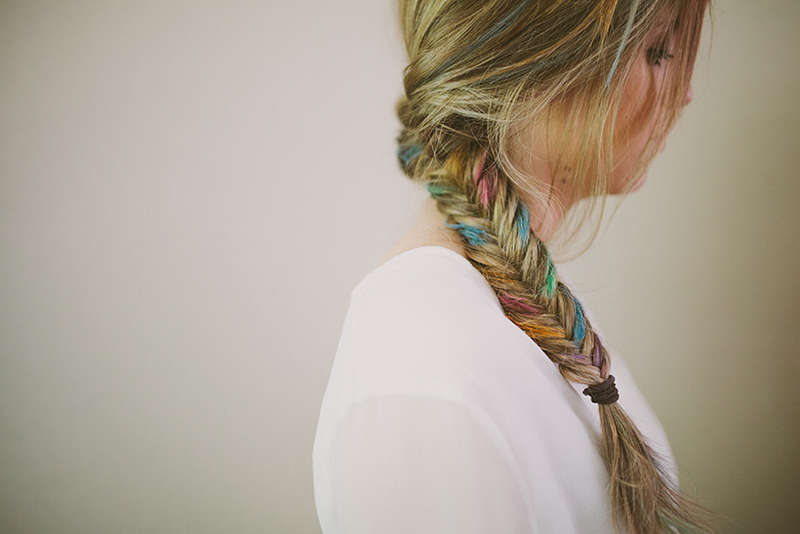 Once you've completed the braid, add various color streaks to strands within the fishtail. Begin by dividing your hair into two sections. Similar to the fishtail, chalk the lower section all the way to the root. Put the top half of your hair in a top knot. With your hair flipped over looking down, french braid tightly to your scalp all the way up to the top of your head. Secure the end of the braid with a small elastic band, wrap it around the bun, and pin it in place with a bobby pin. 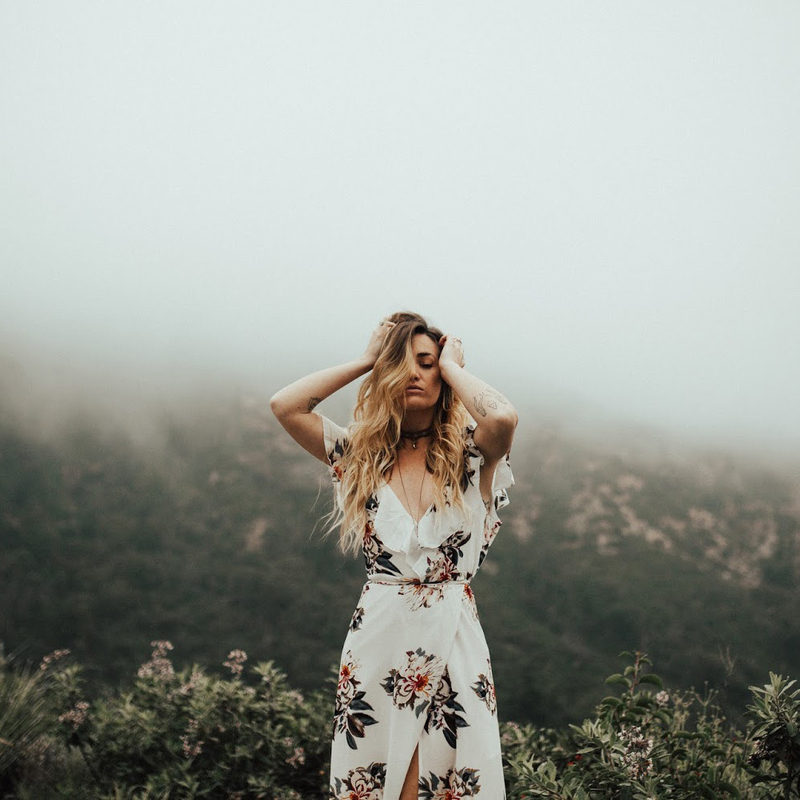 Starting at the crown of your head, begin chalking small strands all along your scalp. 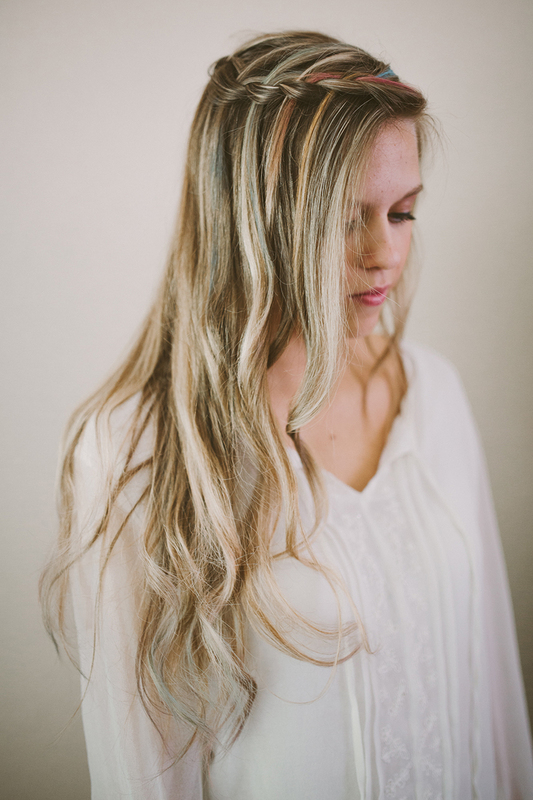 As you're braiding it, carefully choose chalked strands so that they are intertwined throughout the braid. You can find a fishtail braid here, a french braid tutorial here, and waterfall braid here. that is the coolest thing! i love it! i love it! such a fun idea for summer. Where can we find the chalk? Any craft store should in the art section! I love fishtails ! It is so easy to do and the result is beautiful ! It is so pretty with the colors ! Your intern is beautiful! I have been planning on hair chaling (I already have the soft pastels!) Will definitely try these styles! cool idea! that waterfall braid looks very pretty and I'm thinking of getting blonde now. i am overwhelmingly in love with this...!